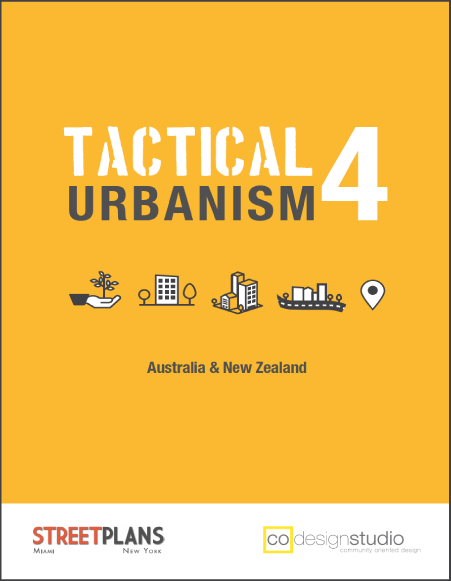 Three and a half years after the release of the first volume of Tactical Urbanism open-source guide, CoDesign Studio researched and wrote the fourth volume for the Australian and New Zealand context with the Street Plans Collaborative. Drawing from a selection of examples from the previous volumes, it juxtaposes Top Down and Bottom Up approaches in city-shaping as well as provides insight on the risks and next steps for Tactical Urbanism. Volume 4 includes additional case studies including: Street Makeover, Local Economic Renewal, Road Repair, Co-trading, Open Space Making, Placeholders, Knowledge Exchange, Visual Catalyst, and Urban Games.